The latest version of the MQ-9 Reaper remotely pilot aircraft (RPA) and its new ground control station have arrived at Holloman Air Force Base in New Mexico, home to the largest MQ-9 formal training unit in the U.S. Air Force. Among enhancements, the MQ-9 Block 5 has an upgraded electrical power system that addresses a power loss issue that dogged older Block 1 models. Starter-generator failures in the older models caused the MQ-9 to drain its backup battery system; this resulted in the loss of 13 Reapers between April 2013 and December 2015, according to a Department of Defense selected acquisition report released in March 2016. The Air Force’s MQ-9 program office established an electrical safety improvement program that produced a kit containing a direct drive brushless alternator—an electrical generator—that serves as a backup alternator to provide up to 10 additional hours of flight time if the aircraft’s starter-generator fails. The General Atomics-built MQ-9 Block 5 features a new high-capacity starter-generator and a backup generator in addition to battery backup for flight-control and other onboard systems. In late June, Creech AFB in Nevada announced that the Block 5 Reaper had flown its “first successful” combat mission on June 23 in support of Operation Inherent Resolve in Iraq and Syria—a 16-hour sortie that included firing two AGM-114 Hellfire missiles and a single GBU-38 Joint Direct Attack Munition. 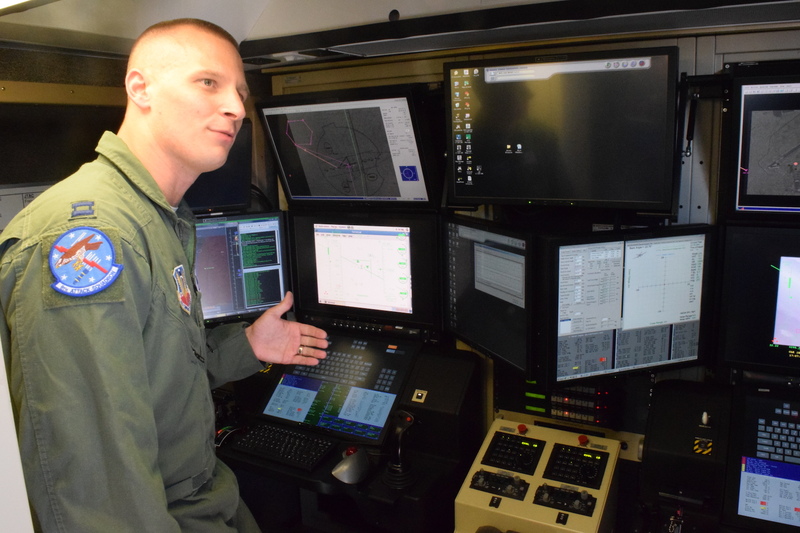 On July 26, the 49th Wing at Holloman AFB said it was in the process of transitioning from the MQ-9 Block 1 to the Block 5 version and from a Block 15 ground control station (GCS) to the newer Block 30 in order to train new RPA pilots and sensor operators. The 6th Attack Squadron received the Block 5 Reaper in June and flew it for the first time in July, according to airmen at the base in the high desert of New Mexico. The wing’s 9th and 29th attack squadrons still use the Block 1 Reaper. Holloman AFB took over from Creech AFB as the RPA formal training unit in 2010, airmen said. Holloman AFB has ramped up since the Air Force assigned priority status to recruiting and retaining RPA crew in 2015. This year, the base will graduate 350 pilots and 350 sensor operators—about 40 percent more than last year, airmen said. There are 14 ground stations at Holloman AFB contained in air-conditioned trailers—nine Block 15s and five Block 30s—with the latter capable of displaying the high-definition video now available from the MQ-9 Block 5 aircraft. There are also nine simulators that serve as GCS mock-ups for training. On any given day there are 10 Reapers airborne, each flying from six to 14 hours based on training requirements. One Reaper crashed near the base on May 2, the 49th Wing announced at the time. The MQ-9s fly to altitudes of 18,000 to 30,000 feet in mainly restricted airspace over the White Sands Missile Range and Fort Bliss; however, the Air Force also has certificates of authorization (COA) from the Federal Aviation Administration to transit unrestricted airspace. One such COA allows MQ-9s to fly a corridor between Holloman AFB and Cannon AFB in north central New Mexico, a base that serves the Air Force Special Operations Command. Ryan said morale is good among the three RPA training squadrons, belying what he thinks is a misconception that Air Force RPA operators are miserable in their jobs.